George Hannah is a small family business that was established in 1995. After leaving school in 1981 I joined British Gas and served a three year City & Guilds apprenticeship in gas technology, attending the British Gas regional training centre at Old Kent Rd and Croydon college. After fourteen years of giving excellent service to British Gas customers I decided to set up my own business, so in August 1995 George Hannah was established. Over the years I have had thousands of satisfied domestic customers including Sutton Housing, Kingston Council (private leasing) and Kings College School Wimbledon to name but a few. Please feel free to browse these pages and contact me if you require any help, I am always happy to answer questions or technical queries you may have. We have all experienced what we think of as excellent customer service. Its the moment when the waiter or the shop assistant has gone over and above the call of duty to meet our needs as customers and made us feel valued and appriciated. What has become important is that improving both customer service and customer engagement may be the small business's best defence against increased competition, especially in the current climate. Here at George Hannah, we know that the service we provide for our customers is critical to our business success as well as fundamental to our role as a market leader. As a small business we find it easier than our bigger competitors to deliver a more personalised and caring customer care experience and we find that this strategy gives us the competitive edge. What we try to do is to personalise our customer service as much as possible and to build a rapport with our customers to try and make every single one feel valued. I always make sure, as far as possible, that I am personally accessible to all my customers, I get to know them to understand their needs and communicate with them on a regular basis. 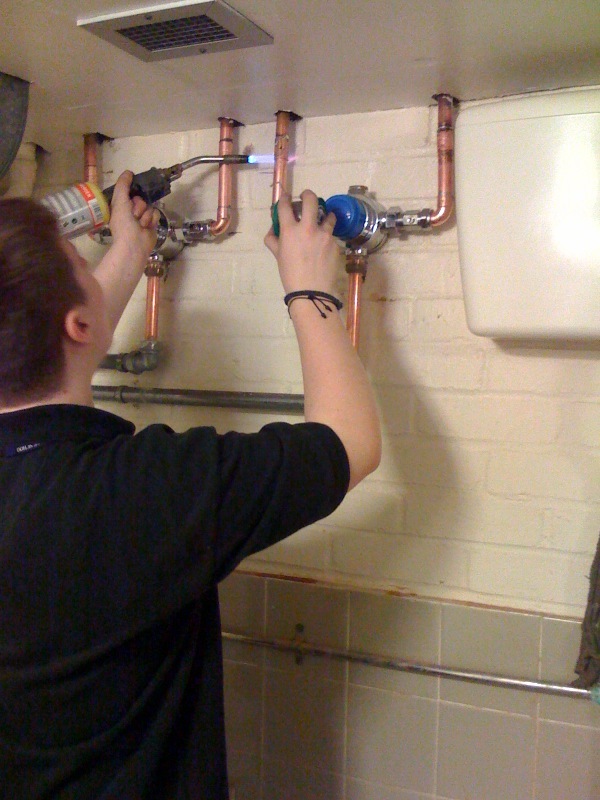 Now after 16 years of working alone I have a new trainee - my own son George has joined the business and is at Chichester college where has just completed his City & Guilds basic plumbing level 2. George is currently working on his NVQ level 2. Here he is fitting two TS6000 shower mixers at Kings College School. A Chip off the old block!